The United States has called for Syria’s “full co-operation” in trying to achieve a comprehensive Middle East peace settlement. Speaking after talks in Damascus, Barack Obama’s envoy George Mitchell said discussions with Syria’s president had been “candid and positive”. 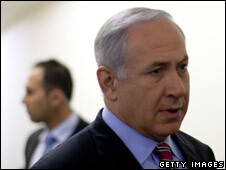 Mr Mitchell said restarting peace talks between Syria and Israel was a “near-term goal”. Mr Mitchell’s visit to Damascus was his second since June, amid a renewed US push for peace since President Obama took office earlier this year. The envoy’s trip comes ahead of a string of visits to Israel this week by leading Obama administration officials, at a time when US-Israel relations are unusually strained. Mr Mitchell said he had told Syrian President Bashar Assad that Barack Obama was “determined to facilitate a truly comprehensive Arab-Israeli peace”. “If we are to succeed, we will need Arabs and Israelis alike to work with us to bring about comprehensive peace. We will welcome the full co-operation of the government of the Syrian Arab Republic in this historic endeavour,” he said. Correspondents say the visit was not expected to bring a breakthrough, but Syrian officials have been encouraged by Washington’s new willingness to listen. In the past, this made Syria a pariah in the eyes of the Bush administration, which cut virtually all ties with Syria, the BBC’s Natalia Antelava reports from Beirut. Washington is a long way away from getting Damascus on its side, but for now at least, the atmosphere of hostility which dominated during the Bush administration seems to be a thing of the past, our correspondent says. Syria was expected to lobby Mr Mitchell on the issue of the Golan Heights, a strategic mountainous area seized by Israel in 1967 which Syria wants back. The BBC’s Middle East correspondent Katya Adler says Mr Obama has been leaning on Israel’s government unusually hard for an American president. Washington has called on Israel to stop all Jewish settlement building in the occupied West Bank, but Israel says it will not curb what it calls “natural growth” there. 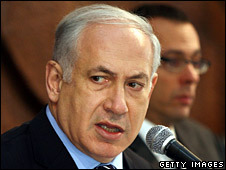 Shortly before Mr Mitchell’s arrival in Israel, Mr Netanyahu said he hoped to reach an agreement with the US. “This relationship is important and strong. Naturally, in the context of friendly relations between allies, there isn’t agreement on all points, and on several issues we are trying to reach understanding,” he said. A United Nations inquiry into the war in Gaza has found that Israel was to blame for at least seven direct attacks on UN operations – including schools and medical centres. Missiles, bombs and small arms were all used by Israel against the UN – leading to dozens of deaths. The UN’s own fuel and aid depot in Gaza was hit with Israeli artillery shells causing widespread damage. The report’s summary accused the Israeli army of “varying degrees of negligence or recklessness with regard to United Nations premises and to the safety of UN staff and other civilians within those premises, with consequent deaths, injuries and extensive physical damage and loss of property.” Ban said at a news conference on Tuesday that the aim of the report, which is not legally binding, was to establish “a clear record of the facts” surrounding incidents involving UN premises and personnel. A total of 53 installations used by the United Nations Relief and Works agency (UNRWA) were damaged or destroyed during Israel’s Gaza campaign, including 37 schools – six of which were being used as emergency shelters – six health centres, and two warehouses, the UN agency said. Al Jazeera’s Kristen Saloomey in New York said the UN secretary-general was still determining the UN’s course of action over the report’s 11 recommendations.The report said the UN would seek reparations for damages from Israel and meet the Israeli government. Shimon Peres, the Israeli president, told Al Jazeera that the report was “one-sided” and that he hoped Ban would take into account Israel’s response to it. Israel’s army concluded its own report into the three-week war on Gaza in late April, finding that Israel followed international law and that while errors occurred they were “unavoidable”. The report found that in seven out of the nine incidents involving UN premises or operations that it investigated, “the death, injuries and damage involved were caused by military actions … by the IDF [Israeli army]”. 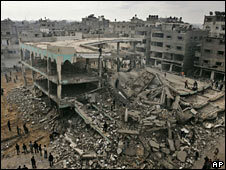 It also said one of the incidents, when a World Food Programme warehouse in the Karni industrial zone in Gaza was damaged, was largely caused by a rocket “most likely” fired by Hamas or another Palestinian faction and condemned those responsible for using such “indiscriminate weapons” to cause deaths and injuries.The investigation included one of the most notorious incidents in the war, when up to 40 people are believed to have died at a UN school in Jabaliya after Israeli mortar shells struck the area. The UN initially said the shells had hit the school but later retracted the claim, while Israel initially said its forces were responding to firing from within the school, but also later reportedly withdrew the statement, although the UN report noted the claim still appeared on the Israeli foreign ministry’s website as of Tuesday. The report also recommended that because there had been “many incidents” during the war involving civilian victims, an impartial inquiry should be mandated “to investigate allegations of violations of international law in Gaza and southern Israel by the IDF [Israeli army] and by Hamas and other Palestinian militants”. Israel’s 22-day war on Gaza left more than 1,400 Palestinians dead, including around 400 children, Gaza health officials said, along with 13 Israelis. Israel has said the aim of its operations in Gaza was to cripple the Palestinian group Hamas’s ability to launch rockets into the south of Israel. Earlier this month an Israeli foreign ministry spokesperson confirmed to Al Jazeera that it would not co-operate with a separate UN Human Rights Council investigation into alleged war crimes during the assault on the Gaza Strip. International rights groups have accused both the Israeli military and Palestinian groups such as Hamas of violations throughout the conflict. The UN secretary-general commissioned the report, written by a special committee led by Ian Martin, former head of Amnesty International, in January, shortly after fighting ended. Israeli tanks have pushed deep into Gaza City, prompting fierce exchanges of gunfire with fighters of the Palestinian militant group Hamas. The UN’s relief agency, Unrwa, says part of its HQ in Gaza caught fire after being hit by Israeli shells. UN chief Ban Ki-moon expressed outrage. Israeli PM Ehud Olmert apologised but said troops returned fire after coming under attack from the UN’s compound. 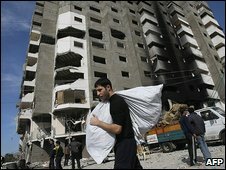 The Hamas interior minister, Said Siyam was reported killed in an air strike. Both Hamas and Israeli officials said Siyam was killed at his brother’s home in Gaza City. Meanwhile, Hamas and Israeli negotiators were said to be making progress towards a ceasefire agreement as they held separate meetings with Egyptian mediators in Cairo. Speaking to reporters on the Israel-Gaza border, Unrwa spokesman Christopher Gunness said three of the agency’s employees were hurt in the attack on its compound in Gaza City. About 700 people were still sheltering in the compound, he said, and the fire had been burning close to five full fuel tanks. Mr Gunness added that Unrwa would not be able to distribute food or medical supplies on Thursday as its trucks were unable to leave the compound. Mr Olmert met Mr Ban and apologised for the attack, but blamed it on Palestinian fighters firing from the UN site. “It is absolutely true that we were attacked from that place, but the consequences are very sad and we apologise for it,” he said. The coastal enclave came under heavy fire from the east in the early morning as soldiers and tanks pushed into Gaza City. Witnesses said they saw soldiers on foot marching behind bulldozers and tanks. The advancing troops came under fire from fighters from Hamas and other Palestinian factions positioned on rooftops and balconies. The building where he lives in the Gaza City suburb of Tel al-Hawa was surrounded by Israeli tanks at one point, he said, and several shells hit the lower floors. Columns of thick smoke rose into the sky over Gaza from fires touched off by the fighting. 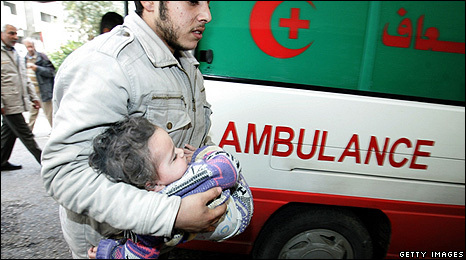 About 70 people have been killed in the fighting on Thursday, Gaza’s Ministry of Health said. Reports said at least 15 rockets had been fired from Gaza into Israel since the early morning, injuring eight people in Beersheba. Nearly 1,100 Gazans and 13 Israelis have reportedly died so far in the conflict. Speaking to the press after meeting Israeli leaders in Tel Aviv, Mr Ban repeated previous calls for an immediate ceasefire, and said the suffering in Gaza was a “dire humanitarian crisis” that had reached an “unbearable point”. Israeli and Hamas envoys have been in Cairo, holding separate meetings with Egyptian negotiators. Egypt has been leading efforts to broker a ceasefire that could include a peacekeeping force being deployed along its border with Gaza to prevent the smuggling of weapons. On Wednesday, Hamas official Salah al-Bardawil said his movement had presented Egyptian negotiators with a “detailed vision” of how to bring about a ceasefire. Hamas, which controls Gaza, has said any ceasefire agreement would have to include a halt to Israeli attacks, the complete withdrawal of Israeli forces and the opening of border crossings to end the blockade of Gaza. Israeli government spokesman Mark Regev said there was “momentum” to the talks. “Ultimately we want to see a long-term sustainable quiet in the south, a quiet that’s going to be based on the total absence of all hostile fire from Gaza into Israel, and an internationally supported mechanism that will prevent Hamas from rearming,” Mr Regev said. Israel launched its offensive on the Gaza Strip on 27 December and has refused to allow international journalists to enter Gaza without supervision, making it to independently confirm casualty figures. The offensive has provoked widespread international condemnation at the cost in civilian casualties and the ongoing humanitarian crisis in the coastal enclave. Sameh, aged three, and Ahmad, 18 months, cry all the time. As she sits on the bed in al-Quds hospital in Gaza City, their mother Fatima al-Shamouny, 36, tries to comfort them. But as she tells their – and her own – story, she sobs too. The boys were found on Wednesday, with their dead father and unconscious mother nearby, four days after the emergency services said they began trying to reach the neighbourhood. They were among 30 people Palestinian Red Crescent workers said they evacuated from Zeitoun, a south-eastern suburb of Gaza City, on Wednesday. The International Committee of the Red Cross (ICRC) said the paramedics found “shocking” scenes of wounded people huddled together in houses among dead bodies, weak after having had no food or water for several days. In one home, the agency said, four small children were found sitting close to their dead mothers, “too weak to stand on their own”. It is not clear if Sameh and Ahmad were in that particular house – it may be that the unconscious Fatima was initially thought to be dead – but she says she and her toddlers were among those who had a long wait for help. The ICRC has accused the Israeli military of failing to live up to its obligations under international law to facilitate the evacuation or to care for the wounded. The agency said it had been requesting safe passage for its ambulances to access the neighbourhood since 3 January, but only received permission to do so from the Israeli Defence Forces (IDF) four days later. The details of exactly what happened at the Shamouny family compound are still sketchy. Survivors have told the News that 26 of the extended family’s 65 members died in Israeli military operations. Their accounts of shelling, and then ground troops surrounding their homes, cannot be independently verified.Fatima, who was wounded in the chest, says two of her sons, her husband, her aunt, her uncle and her brother-in-law were all killed. “One of my sons crawled to our neighbour’s house – he was injured – and he called some of the local radio stations to ask for help. But the help arrived late. Everybody had died,” she said. “On the third day, I passed out. I don’t know what happened until I found myself here in the hospital,” she said. Wael Faris al-Shamouny, 39, another member of the extended family, smoked and sipped black coffee as he sat on the floor in the hospital corridor. He says he lost five sons and his wife, and believes some of the dead may have survived if given medical treatment earlier. “We tried to help them, but we didn’t have first aid things in our house. We spent days without food, without water – the wounded were bleeding for four days,” he said. The ICRC said the wounded had to be transported about a kilometre on a hand-pulled donkey cart because large earth walls erected by the Israeli army had made it impossible to bring ambulances into the neighbourhood. Katarina Ritz, the ICRC’s head of mission in Jerusalem, said experienced Palestinian emergency workers wept at the scenes they were confronted with. She said Israeli troops were within about 100m of the houses in question, and that the ICRC believes the soldiers “must have been aware” of the presence of the wounded people, because of repeated requests from aid agencies for access. Under international law, she said, even if there are security concerns meaning the injured cannot be evacuated, “the minimum is to treat these people, to feed these people, give them water, and keep them in a safe place”. The Israeli military said it was investigating the case. It said it is “engaged in a battle with the Hamas terrorist organisation that has deliberately used Palestinian civilians as human shields”. And it stressed it works in “close co-operation with international aid organisations during the fighting, so that civilians can be provided with assistance”. Earlier in the week, an ICRC spokeswoman told the BBC attempts to co-ordinate safe passage for ambulances were so slow that people were dying as they waited. Not all ambulance drivers in Gaza have been waiting for co-ordination with the Israeli military, and health officials in Gaza say 10 paramedics have been killed trying to rescue the wounded since the Israeli operation began. Israeli Defence Ministry Spokesman Peter Lerner said that co-ordinating the movements of ambulances has been “extremely difficult because of heavy gunfire”. He said that even during the three-hour lull Israel declared to allow humanitarian operations, Hamas militants continued to shoot at Israeli forces. Outside the hospital, as Fatima Shamouny told her story, dozens of people gathered as Thursday’s ICRC-led convoy of ambulances prepared to leave. They came with addresses where they believed injured people were trapped. One man’s hands shook so much with fear that he had to ask for help writing the directions down. Finally, the convoy received clearance, and drove away. It was headed back to Zeitoun, where the ICRC said there were reports of more injured people stranded, and another area in northern Gaza, which ICRC workers had not even reached yet. 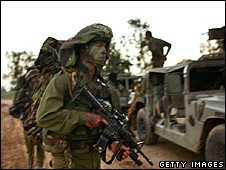 Israel has confirmed that reserve units have been sent to the Gaza Strip, as its campaign there enters a 17th day. But military officials denied this heralded a new phase in Israel’s offensive against Hamas militants. Earlier, PM Ehud Olmert said Israel was nearing its military goals and operations would go on. Israel says it carried out 12 overnight airstrikes. 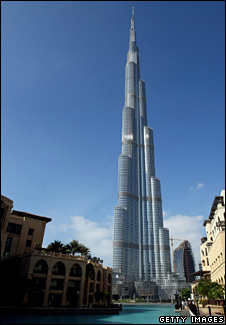 One rocket attack was reported from Gaza on Monday morning but there were none overnight. Previous nights have seen as many as 60 pre-dawn Israeli strikes. “We’re keeping the military pressure up on Hamas, we think our pressure has been effective and continues to be effective in taking apart their military machine,” he said. The Israeli military said some reservists were being used to refresh troops currently in action in Gaza, but that this did not yet constitute an escalation of the campaign. Brig Gen Avi Benayahu, Israel’s chief military spokesman, said thousands more – who are to comprise a new, expanded phase in the ground operation – were still in training and had not been deployed. On Sunday Israel dropped new leaflets into Gaza and left phone messages warning Gazans to stay away from areas used by Hamas, saying its operation would soon enter “phase three”, the Associated Press reported. In Cairo, talks between Hamas and Egyptian intelligence chief Omar Suleiman were described by an unnamed intelligence official as “positive”, the state news agency reported, without providing details. Former UK Prime Minister Tony Blair, now Middle East envoy for the Quartet – the US, EU, UN and Russia – is due to meet Egyptian President Hosni Mubarak in Cairo on Monday morning. On Sunday, after an Israeli cabinet meeting in Jerusalem to consider the country’s next move, Mr Olmert praised the military’s “impressive gains” in Gaza and said it was time to “translate our achievements into the goals we have set”. Referring to last week’s UN Security Council call for an immediate ceasefire, Mr Olmert said “nobody should be allowed to decide for us if we are allowed to strike”. Both Hamas and Israel have rejected the UN resolution. In Gaza the main hospital is close to collapse, according to two Norwegian doctors who have been working there during the conflict. They said patients at al-Shifa hospital are dying because of a lack of specialist doctors and basic medical equipment. 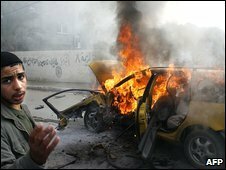 They told the BBC that 12 ambulance staff had been killed in shelling, despite their clearly-marked vehicles. Frequent power cuts mean surgeons are having to perform some operations by torchlight, they said. “I think we could sum it by saying that it’s been a living hell for the Palestinians,” said Dr Gilbert. Aid agencies say Gaza’s 1.5 million residents are in urgent need of food and medical aid. Meanwhile, Israel’s army denied deploying white phosphorus bombs in Gaza, after Palestinian medics said they had treated patients for burns caused by the munitions. 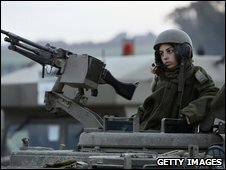 Israel began Operation Cast Lead just weeks before parliamentary elections in the country, as a six-month truce with Hamas unravelled.